We know what you're doing right now! You're looking at a computer screen, aren't you? Ophthalmologists call this "computer vision syndrome" (CVS), "computer eye strain," "computer eye irritation" or "computer dry eye." If you answer "yes" to question #1 and at least two others, you may be experiencing computer vision syndrome. Are you a "Computer Nerd" who uses a computer more than two hours a day? Do your eyelids sometimes become heavy or tired during computer use, even though you've had plenty of sleep? The highly complex "tear film" covering the eyes consist of water, oil, electrolyte, antibodies, protein and mucus. The tear film moistens, lubricates, oxygenates and protects the eyes; and forms a light transmitting surface that enables you to see. 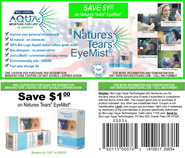 Nature's Tears EyeMist instantly and conveniently replaces lost tear film water. To supplement tear film water and minimize dry eye symptoms, mist your eyes frequently with Nature's Tears EyeMist. With no dosage limit, all-natural Nature's Tears EyeMist may be applied whenever computer dry eye symptoms are experienced. Always keep Nature's Tears EyeMist beside your computer (and combine it with a complete daily hydration program that includes drinking 8-10 glasses of water a day). An eye care professional may prescribe special "computer glasses." Keep a glass of water (And Nature's Tears EyeMist) near your desk to help humidify the air.